In its Weekly Report On Israeli Human Rights Violations in the Occupied Palestinian Territories for the week of 10 – 16 December 2015, the Palestinian Center for Human Rights (PCHR) found that Israeli forces killed 5 Palestinian civilians, and a child succumbed to her injuries, making a total of 6 Palestinians dead of Israeli-inflicted injuries this week in the West Bank and Gaza Strip. 96 Palestinian civilians, including 14 children and 5 journalists, were wounded by Israeli troops. On 11 December 2015, Israeli soldiers stationed at a checkpoint established at a checkpoint stationed at a checkpoint established 20 days ago on Sa'ir Main Road, east of Hebron, killed 'Issa Hroub (56) from Deir Samit village, southwest of Hebron. The aforementioned civilian was killed when Israeli forces opened fire at his car. The aforementioned was on his way back from al-Shyoukh village via Sa'ir road. The Israeli soldiers claimed that Hroub intended to carry out a ramming attack with his vehicle. On the same day, Israeli forced opened fire at 'Oday Irshayed (24) from al-Salam Street in Hebron. As a result, he was hit with two bullets from to his chest and neck. The aforementioned civilian was participating in a protest following the Friday Prayers in Ras al-Jorah Intersection, north of the city. It should be mentioned that 'Oday is the brother of Dania Irshayed (16), who was killed by Israeli soldiers at the entrance of al-Ibrahimi Mosque on 25 October 2015 under the pretext of attempting to carry out a stab attack. On the same day, medical sources declared that Samah 'Abdel Mo'men 'Abdullah (18) from ';Amoriah village, southeast of Nablus, succumbed to her wounds. The aforementioned girl was wounded on 23 November 2015 when Israeli soldiers stationed at Howarah checkpoint, south of Nablus shot dead 'Alaa' Hashah (16) from 'Askar al-Jadid refugee camp, northeast of the city. Meanwhile, she was hit with a bullet to the head and taken to Bensolon Hospital in Israel. She stayed there until her death was declared. During the past week, Israeli forces conducted 106 incursions into Palestinian communities in the West Bank. 107 Palestinian civilians, including 28 children, were abducted. 20 of them, including 14 children, were abducted in occupied Jerusalem. A number of houses belonging to families of Palestinians, who were suspected of attacks against Israelis, were raided. Moreover, measures of the houses were taken for house demolitions. Jewish majority efforts continued in occupied East Jerusalem. A house in al-Shaikh Jarrah neighbourhood was demolished and demolition notices were issued. Israeli forces turned the West Bank into cantons and continued to impose the illegal closure on the Gaza Strip for the 9th year. Dozens of temporary checkpoints were established in the West Bank and other were re-established to obstruct the movement of Palestinian civilians. 8 Palestinian civilians, including a child and 4 brothers, were abducted at military checkpoints. As part of targeting Palestinian fishermen, on 10 December 2015, Isreli gunboats stationed off al-Waha shore, northwest of Beit Lahia, and off al-Sudaniyah shore, west of Jabalia, north of the Gaza Strip, opened fire in the civinty Palestinian fishing boats sailing within 3 nautical miles. The shooting repeated on 13 December 2015, but no causalities were reported. Israeli forces continued to target the border area along the Gaza Strip. 5 Palestinian civilians were wounded in the southern Gaza Strip in 3 separate attacks. A Palestinian civilian was abducted at Beit Hanoun "Erez" crossing, north of the Gaza Strip. On 13 December 2015, the Israeli Collection Department issued a notice to evacuate two residential buildings in "Batn al-Hawa" neighbourhood in Silwan village, south of East Jerusalem after the settlement organization “'Ateerat Cohanim” obtained it under the pretext of “settlers’ ownership of the land”. According to PCHR's investigation, the Israeli authorities handed an evacuation order to Yousef Basbous and his sons that was issued by the Israeli Collection Department in favour of the settlement organization “Ateerat Cohanim” claiming that the land is owned by settlers since the year 1881; they also imposed large sums of money on the family as “compensation for lawyers”. On 15 December 2015, joint staffs from the Israeli Municipality and forces raided a building belonging to the family of Khail 'Alian in Jabal al-Mukkaber village, southeast of East Jerusalem, and handed the family an administrative demolition under the pretext of building without a license. 'Alian family said that the building belonging to Khalil 'Alian and his sons is comprised of 3 floors; in each of which there is a 130-square-meter apartment. The building shelters 25 members. 16 December 2015, Israeli military bulldozers demolished a house belonging to Ibrahim Diab in al-sheikh Jarrah neighborhood, north of East Jerusalem's old City under the pretext of building without a license. The house used to shelter a family of 7 members, including 5 children and was build years ago. The family rebuilt parts of the 85-square-meter house. On 12 December 2015, activists from Peace Now organization revealed that the Israeli Civil Administration issued a military order, which declared about 30 dunums of Palestinian lands in Deiristiya village in Salfit and Jinsafut village in Qalqiliya, as “State Land”. The dunums to be confiscated are located between the settlements of "Karne Shamron" and "Ma'ale Shamron" established on the lands of the aforementioned villages. On 10 December 2015, a group of settlers under the Israeli forces' protection backed by military vehicles moved into "al-Hafirah" area between 'Arabah and Markah villages, southwest of Jenin. On 13 December 2015, a group of settlers moved into the area of "Tarsalah settlement", which was evacuated in 2005, and also known as "Sanour Camp" established on Palestinian lands, south of Jenin. The settlers set their tents and stayed for some time in the area to perform Talmudic prayers. 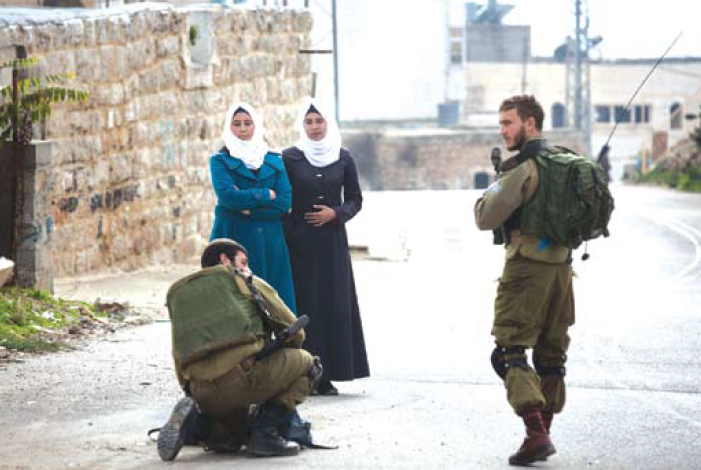 The settlers later withdrew as Israeli soldiers arrived at the area. No further incidents were reported. At the checkpoints and public roads: 2 Palestinian civilians, including a child, were hit with live bullets. In peaceful protests against the annexation wall and settlement activities: nine Palestinian civilians, including 2 children and a photojournalist, were wounded. Six of them were hit with live bullets; two civilians with rubber-coated metal bullets and one with a sponge-tipped bullet. On 11 December 2015, in excessive use of force, Israeli forces shot dead Sami Madi (41) from Deir al-Balah in the central Gaza Strip when he was participating in a protest organized by hundreds of Palestinian civilians adjacent to the border fence between the Gaza Strip and Israel, east of al-Bureij in the central Gaza Strip. As a result, he was hit with a bullet to the chest.